his book is a collaboration between Anglo-Welsh poet, critic and publisher David Annwn and the celebrated San Francisco calligrapher Thomas Ingmire. 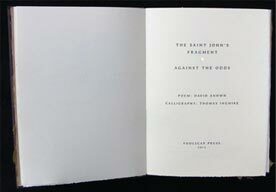 Originally, they created a truly remarkable one-of-a-kind book with the subject matter Saint John's Fragment. This was great for the owner, but leaves nothing for the rest of us. Weve gone back to the collaborative drawing table with David and Thomas to create our own edition, the result of a second collaboration, and although still sharply limited, it allows something for those of us who want an echo of their astounding original work. 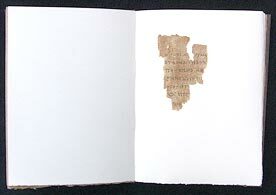 The piece of papyrus called the Saint John's Fragment was acquired in an Egyptian market in 1920 by Bernard Grenfell, an English scientist and Egyptologist. 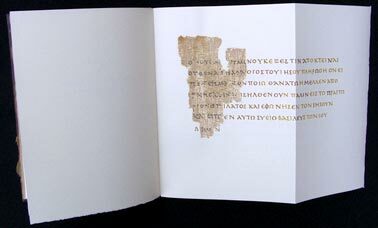 It now resides in the collection of the Rylands Library at the University of Manchester in England (and known there as Rylands Library Papyrus P52). 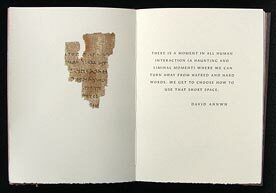 This scrap of paper-like material, measuring only 3.5 by 2.5 inches, is made from the pith of the papyrus plant. It is dated from between 100 CE and 150 CE and is generally accepted as the earliest extant record of a canonical New Testament text. Written on both sides of the papyrus, it must have been part of a codex, that is, a collection of sewn and folded leaves, not a scroll or an isolated sheet. That being the case, it would be among the earliest surviving examples of a literary codex. It was written in Greek in a script known as Hadrianic, named after Hadrian (76 CE-138 CE), the Roman Emperor of that era. Anglo Welsh poet, critic and publisher David Annwn has responded to this fragment in a poem that always seem to bear just below the surface remembrance of a statement from the Rylands Library: “The importance of this fragment is quite out of proportion to its size, . . .” And yet it exists, considering all which could have destroyed it, against the odds. Thomas Ingmire's calligraphy shows the image of the actual fragment, then the restored page, then the English translation of the restored pagein flaps that extend the pages in order to allow for the missing text. 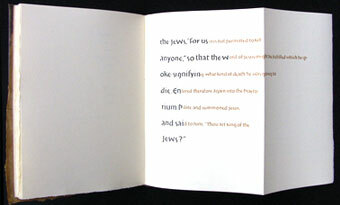 The calligrapher has added gold tooling to the title and half-title pages. 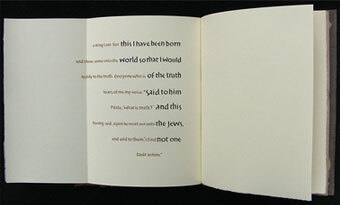 The book is printed letterpress on Frankfurt Cream paper and bound in heavy handmade paper from Cave Paper. 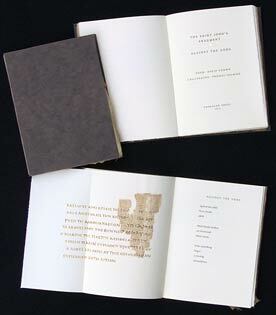 This numbered edition limited to 116 copies is signed by the poet and calligrapher. 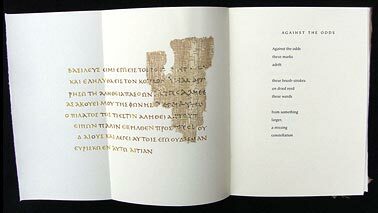 The Saint John's Fragment ♦ Against the Odds is published in an edition limited to 116 numbered copies signed by both the poet David Annwn and calligrapher Thomas Ingmire. The book is 40 pages and measures 8 1/4 inches tall x 6 1/4 wide and is printed letterpress on Frankfurt Cream and bound in hand-made Cave Paper, the endsheets are hand-made Lokta. The price is $275.00 plus appropriate CA sales tax. Shipping is $10.00.